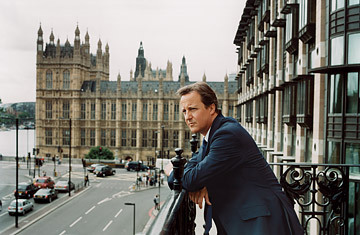 David Cameron: UK's Next Leader? There's a big-ticket event in Loughborough, and not even the latest Eddie Murphy comedy, Meet Dave, fresh from its Hollywood premiere and just starting a run at the town's Reel Cinema, can compete. Le tout Loughborough has turned out to meet another Dave, a politician seeking the highest office in Britain. This evening he'll speak in the town hall, in a room overlooking "Sock Man," a bronze figure naked except for one sock and a strategically positioned leaf. It's a monument to the hosiery industry in this central England town  not quite Berlin's Siegessäule, the portentous backdrop to Barack Obama's big foreign policy speech in July. David Cameron, leader of the Conservative Party and (barring a dramatic reversal in the polls) Britain's Prime Minister-in-waiting, is wary of appearing hubristic. That would be an easy mistake for this 41-year-old political prodigy, who rose with extraordinary speed from new Member of Parliament in 2001 to the pinnacle of his party just four years later. From the outset, Cameron conducted himself with the confidence of a veteran. Only three days into his job as Conservative leader, he faced then Prime Minister Tony Blair, one of the greatest natural politicians of the age, in the House of Commons. "You were the future once," quipped Cameron, his skin smoother and shinier than Sock Man's. His opponent suddenly looked old and spent. Now Blair is long gone, and the brief bloom of popularity enjoyed by his successor, Gordon Brown, has withered. Trailing Labour this time last year, the Conservatives are looking unassailable. Labour's missteps and infighting account for some of this success. The rest is down to Cameron: his reinvention of his cantankerous party and his reinvention of himself as an avatar of the modern age. "David is comfortable with Britain as it is today," says shadow-cabinet member David Willetts. "It's essential for making the party more electable that you're not trying to re-create Britain as it was in 1958." That's why there's such a buzz around the tall, sleek figure bestriding the podium in Loughborough. The town won't need much of a push to switch allegiance from Labour to Tory and neither will the country. A general election isn't due until spring 2010, and Cameron's 20-point lead in the opinion polls could yet sag if fate gifts Labour a game-changing event or an economic miracle. But for anyone who recalls the animosity toward the Tories that ushered Labour into power in 1997 and helped keep it there for more than a decade, and for anyone who has witnessed the old antipathies between Britain's lower orders and posh blokes like Cameron  and he is very posh, a direct descendant of King William IV  it's obvious that deeper political and social shifts are taking place. To decode them, and to understand the Tories' widening appeal, the proper study is Cameron himself. In some ways, he's a deeply private man, but he also relishes being center stage and understands the art of public relations. "People like to meet you in person, get the measure of you, know what makes you tick and what you care about," he says on the train back to London after an hour of unvetted questions from the burghers of Loughborough. He's been pressing the flesh across Britain and regularly files a video blog that has included intimate footage of his family. He also allowed Dylan Jones, the editor of GQ magazine, to shadow him over a year for a book of interviews called Cameron on Cameron, in which he talks fluently about everything from high politics to low culture. Yet despite such constant self-exposure, an easy affability that reads as openness and his willingness to perform without scripts or teleprompts, Cameron remains an enigma. Part of what makes him hard to categorize is that he's above all a pragmatist, priding himself on reasonableness rather than ideological fervor. During a wide-ranging interview at his Westminster office, he quickly dismisses the notion that his ideas amount to a political theology that might one day be known as Cameronism: "I think you just get on with it. It's the best thing to do in politics rather than trying to endlessly work out the definition of who you are or what you're about." Introspection isn't his bag. "I'm a very simple soul," he insists. He's certainly a well-defended one. Francis Elliott spent 18 months researching and observing him as co-author of the biography Cameron: The Rise of the New Conservative, yet still finds him elusive. "I've come to think that the word that best describes Cameron's personality is glassy," Elliott e-mails. "Smooth, cold, so flawless and polished you forget it's a barrier  until you try to cross it." In a world accustomed to the incontinent confessions of public figures, there's something refreshing about Cameron's ability to hide in full view. But it does raise questions about what lies beneath his debonair façade. "Over the course of the last decade, we've seen different leaders who are good at different things, and what they've demonstrated is there are some pieces you can't not have," says David Davis, runner-up to Cameron in the Tory-leadership contest and until June a member of his shadow cabinet. "David has got the key things. He's good in the House [of Commons]. He's good on television. He's pretty good at policy. He's pretty good at the diplomatic wing of leadership. There are no missing slots." Clever, articulate, well educated, socially adept, politically astute, photogenic, charming, charismatic, Cameron does fill all the slots  bar one. His charmed life (the gilded youth of this son of a wealthy stockbroker; the education at that most élite of British schools, Eton College, followed by Oxford University; the meteoric political advancement) has been very short of the character-forming struggles that garnish many a political résumé. While across the Atlantic the presidential contenders flaunt their personal stories, parade their families and brandish their scars, the Conservatives trust that buttoned-up Brits care less about such things. They are betting that class no longer determines electoral outcomes. They may well be right. But even some supporters fear that the making of Cameron could yet prove his unmaking. For now, though, his rise offers powerful evidence not just of his political prowess but also of how much Britain has changed. David Worth, fresh from the U.S. and in his first term as a postgraduate student at Oxford, had barely heard of the Bullingdon Club when in 1988 he was asked to join. Fellow students were impressed: founded in the 18th century, the venerable dining association confers membership to its ultra-exclusive ranks by invitation only. At his Bullingdon debut, Worth, wearing the distinctive tailcoat with ivory lapels that is required for all Bullingdon functions, caught a boat to Cliveden, a stately home turned luxury hotel. It was on board that he encountered Cameron. "There was a surreal Brideshead Regurgitated quality to the evening," says Worth, who went on to become a consultant and speechwriter for several heads of state. "I remember David quoting Winston Churchill extensively by memory  Churchill was a bit of a lush, so they were quotes about drinking  and he was very funny. A few people leaned over the side of the boat occasionally because if you've drunk two bottles of Champagne in an hour, your stomach is going to get queasy. I don't know if David had only sipped a bit, but he was articulate and lucid, and I always remember him like that  the center of attention."